A while ago we went to get the car fixed in one of the Arab villages in Israel's northern coastal plain near where my husband was born. The area is a microcosm of Jewish-Arab coexistence, characterized by the kind of easy relations between good neighbors. The repair shop is run by a man named Muhammad, who welcomed us into his office and offered us Turkish coffee with cardamom, in the best Arab tradition. Despite the complex situation in the Gaza Strip, there was no tension in the air. The day we went was typical of the Israeli operation in the Gaza Strip. At that point, the Palestinian terrorist organization ruling the Gaza Strip had attacked Israel, Jewish and Arab civilians alike, with a daily average of 100+ rockets (to say nothing of the terrorist tunnels Hamas dug and planned to use on the Jewish New Year in a massive, simultaneous attack on the kibbutzim around the Gaza Strip). The overall situation might have influenced Muhammad, but nothing of the drama in the south was reflected in the way he received us, which was, as usual, courteous and friendly. Pouring the coffee, he said the following: "I want you to know that in our village there are 10 boys serving in the IDF and fighting Hamas in the Gaza Strip. We even have one girl serving in Border Police Force." I was very surprised. Israeli Arabs, unlike most of the Israeli population (with the exception of the ultra-Orthodox), are not subject to military conscription, and most of them refuse to contribute anything to the common Israeli social effort, not even to their own communities. So I asked him if the Arabs from his village who served in the IDF were Muslims, and whether they wore their uniforms when they came to the village on leave. Yes, he said, they were Muslims. For them and their families, everyone who lived in Israel was an Israeli and had to serve. Hamas' rockets, he said, did not distinguish between his family and ours, they were all meant to kill Israelis. I asked him how open public discourse was in his village. Did the villagers discuss current events objectively, or did they blindly support the Gazan leadership? He said people spoke openly and without fear, and that most of them opposed Hamas' aggression against Israel, and would not live anywhere else in the Middle East. It was not the first time I had heard Israeli Arabs openly criticizing the situation in the West Bank and the Gaza Strip. 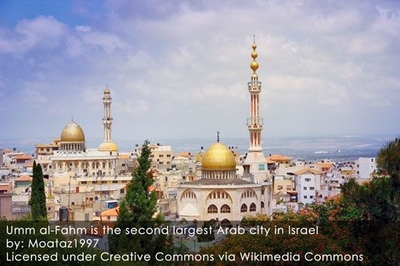 I heard the same things during a visit to Umm el-Fahm, a large Arab Israeli city in the north, the birthplace and stronghold of Ra'ed Salah's Islamic Movement, which like Hamas in the Gaza Strip, is the Israeli branch of the Muslim Brotherhood. Even there, I heard local residents criticizing the Palestinian leadership in the West Bank and Gaza, as well as the Islamic Movement in Israel. Some of them even joked that in the situation created in the Middle East by the Arab Spring, the only place the Islamic Movement could operate freely was the State of Israel. The absurdity is that the movement has not been outlawed, despite the fact that it is hostile to Israel and its Jewish citizens, and advocates its destruction. The people who told the joke said that places like Egypt, for example, where official policy and objectives were similar to those of the Islamic Movement in Israel, the movement had been outlawed and its leaders thrown in jail, and some had been executed. Another issue sometimes discussed with Israeli Arabs is the exchange of population and land for the sake of a peace agreement. Israel has often suggested that the settlements in Judea and Samaria near the 1967 border be annexed by Israel, and that Arab settlements in Israel near the border be annexed by the Palestinian Authority, and become part of the eventual Palestinian state. It turns out that the residents of Umm el-Fahm are deeply concerned about such a possibility and openly oppose it. One of them even said, "My grandmother always says that "it is better to be in hell with the Jews than in paradise with the Arabs..."
The people I have spoken to had great political awareness. They all knew that even though Israel unilaterally withdrew from Gaza in 2005, Hamas fired rockets at Israeli cities and dug attack tunnels under the border to abduct Israeli civilians and soldiers. They all knew that the Gazan border with Israel was meaningless for Hamas and that the organization had openly declared that its objective was the destruction of the State of Israel. No less serious was Hamas' attempt to initiate what it called the "Ramadan intifada." It called on the Arabs in the West Bank, Israeli Arabs (which it refers to as "the Arabs of 1948") and the Arabs of east Jerusalem to rise up against Israel. Luckily, the call was only partially answered. In Wadi Ara, a predominantly Arab area in the north, there were groups of masked men, mostly young, who blocked the main roads and attacked Israeli vehicles with Molotov cocktails. During Operation Protective Edge, Hamas made a supreme effort to destroy the delicate fabric of the various communities in Israel, Jewish, Druze, Christian, Muslim and Bedouin, and attempted to create chaos within the country to influence the outcome of the war. In an effort to preserve the delicate fabric of Israeli society, the Arab village elders tried to stop the vandalism carried out by Arab youths, but over the years the deterioration of their patriarchal tribalism weakened their authority. The result was that many Jewish Israelis, who normally went to the restaurants, auto repair shops, supermarkets and clothing stores in Arab cities and villages, kept away, fearing for their safety and the safety of their families, dealing an economic blow which was roundly criticized by the Arab shopkeepers who suffered. The conduct of Israeli Arab elected officials is often discussed. While many Israeli Arabs objected to the violence during the operation, some of their representatives in the Israeli Knesset fomented it. One of the most prominent offenders was Hanin Zoabi, who confronted the Israel Police Force and made offensive remarks to Arab policemen who came to disperse a demonstration. I asked Muhammad for his view. He said the Arabs in the Knesset did not care about their constituents, and felt that the more extreme their positions were and the more solidarity they showed with the Palestinians in Judea, Samaria and the Gaza Strip, the more votes they would get in the next election. He said that in effect, they were not doing their jobs. In fact, it was during Operation Protective Edge that Knesset members Zoabi, Zahalka and Ghattas, with unknown funding, chose to go to Qatar to visit Asmi Bashara, another Arab Knesset member, a criminal who fled the country when it was discovered that he had spied for Hizballah in the second Lebanon War. He is now in Qatar, along with Khaled Mashaal, the head of Hamas' political bureau. How ironic that it was during a war that three members of the Israeli parliament chose to visit Israel's enemies. I could not help but ask myself what would happen if, during the wars in Afghanistan and Iraq, both of America's Muslim congressmen felt the time was ripe to meet with Osama bin Laden, and/or issue statements against American citizens and soldiers while being interviewed by Al-Jazeera America. Were the demonstrations held in Umm el-Fahm and elsewhere anti-war protests or pro-Hamas riots? Would the American public consider a demonstration in support of al-Qaida or ISIS a legitimate anti-war protest or treason? Clearly, the war in Gaza created a dissonance for some Israeli Arabs, and the conflict and the pictures made both Jews and Arabs emotional. The identification of some Israeli Arabs with the Palestinians is legitimate, but the objective has to be changed from Israel's destruction to a long-term solution for the Palestinians living in the various Arab countries. The status of refugee cannot be inherited and there are almost none left from the 1948 conflict. The treatment the Arab countries give their descendants is criminal, it is genuine apartheid. They are not citizens, they have no rights, they do not have equal opportunities. However, the worst criminal is the United Nations, whose UNRWA deliberately perpetuates discrimination and focuses on keeping the remaining the Palestinians refugees and their descendants as refugees forever, while neglecting the millions of genuine refugees throughout the Africa and the Middle East, especially Syria and Iraq. Their lives are in danger, but because of anti-Semitism and the narrow interests of the UN and UNRWA leaders, they are ignored. The time has come for Syria, Jordan and Lebanon to give the descendants of the original refugees citizenship, as Israel gave citizenship to the Jewish refugees from the Arab countries who fled in 1948. There are many agencies trying to destroy the relations between Israel's communities and ethnic groups. Israel's Jews and Arabs have weathered crises before, because they have mutual economic and social interests. Daily life is stronger than radical Islamic fundamentalism, which is trying to make political capital in Israel. Various Israeli Knesset members contribute nothing to the lives of their constituents, destroying their trust, which has been noted by many Israeli Arabs. Recent surveys have indicated a rise in the participation of Arab in the National Service (a non-military framework of public service) as well as a significant rise in the number of Christian Arabs enlisting in the IDF. Arab society in Israel is not monolithic, and the amazing pluralism of Israeli life means Christian Arabs, Bedouin and Druze serve in and lead elite IDF units. For example, the Druze Golani Brigade Colonel Rasan Alian, who was wounded, left the hospital to return to command his soldiers on the battlefield in Gaza. I recently lectured on Palestinian terrorism before an academic audience at Kibbutz Sde Boker. Afterwards I spoke with Qassem, a Palestinian journalist from east Jerusalem, and asked him if I had said anything that offended him. He said no, that he was not angry with me, he was angry with the Islamists who had dragged us into the war. It was hard to admit, he said, but today the only safe place for an Arab in the Middle East was the State of Israel. Remember the 'Hebron Pogrom of 1929?' What happened? Their 'Mufti' lied and said that the Zionists are bombing 'Har HaBayit.' The Arabs rioted and murdered Jews. One Yiddish speaking Arab employee of a Jewish business, murdered his boss. This story tells a lot. The Moselm Arab has many motivations to kill: Nationalism..they think 'Eretz Yirsrel' is theirs and we took it ruthlessly without rights . Robbery. 'Esav Hates Jacob. We are 'infidels,' etc. Terrorism aims to create fear (by the "enemies") and hate (against the "enemies"). Until we learn that the war is not simply to overpower them by firepower, but to win their "friendship base", e.g. those "moderate" muslims who still support the radicals, we will be fighting a losing battle. Until we learn that guerilla warfare (including terrorism) aims at the hearts and minds, rather than short-term military power, we will only create more enemies. We have to demonstrate that terrorism does not scare us, convince those friendly towards the terrorists that we are not the demons we are portrayed as _and_ that we are stronger military than the terrorists. Unless we do all three, the terrorists will keep on growing stronger. This is why Mao Tse Dong won, because the nationalist failed in all three of these aspects.